37 C.F.R. 1.171 Application for reissue. An application for reissue must contain the same parts required for an application for an original patent, complying with all the rules relating thereto except as otherwise provided, and in addition, must comply with the requirements of the rules relating to reissue applications. 37 C.F.R. 1.173 Reissue specification, drawings, and amendments. (1) Specification, including claims. The entire specification, including the claims, of the patent for which reissue is requested must be furnished in the form of a copy of the printed patent, in double column format, each page on only one side of a single sheet of paper. If an amendment of the reissue application is to be included, it must be made pursuant to paragraph (b) of this section. The formal requirements for papers making up the reissue application other than those set forth in this section are set out in § 1.52. Additionally, a copy of any disclaimer (§ 1.321 ), certificate of correction (§§ 1.322 through 1.324 ), or reexamination certificate (§ 1.570 ) issued in the patent must be included. (See also § 1.178 ). 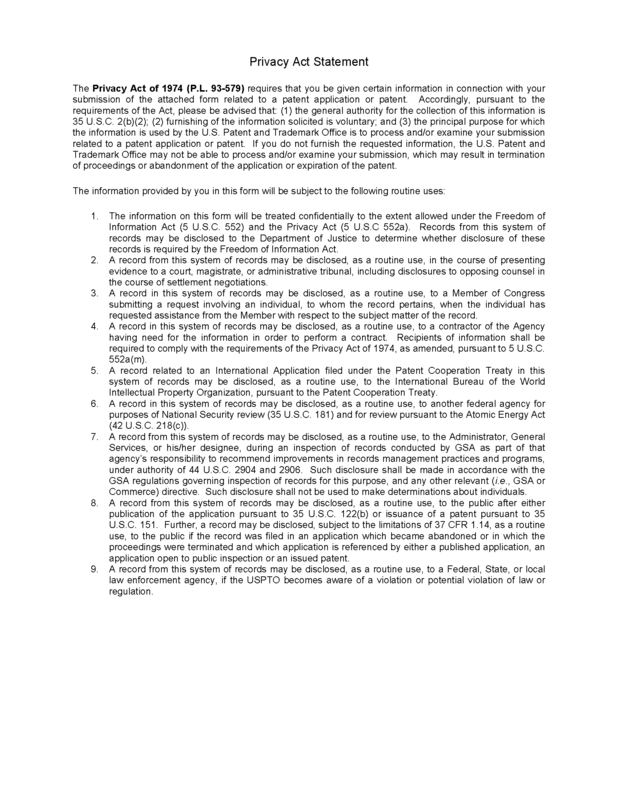 The specification (including the claims and any drawings) of the reissue application is the copy of the printed patent for which reissue is requested that is submitted by applicant as part of the initial application papers. The copy of the printed patent must be submitted in double column format, each page of double column format being on only one side of the piece of paper. It should be noted that a re-typed specification is not acceptable in a reissue application; the full copy of the printed patent must be used. In addition, an applicant for reissue is required to file a reissue oath or declaration which, in addition to complying with 37 CFR 1.63, must comply with 37 CFR 1.175. Where the patent has been assigned, the reissue applicant must also provide a consent of assignee to the reissue and evidence of ownership. Where the patent has not been assigned, the reissue applicant should affirmatively state that the patent is not assigned. (B) providing a separate amendment paper with the reissue application. In either case, the amendment must be made pursuant to 37 CFR 1.173(b) and must comply with all the provisions of 37 CFR 1.173(b)–(e) and (g). Note that the provisions of 37 CFR 1.53(b), effective December 18, 2013, stating that an application may be accorded a filing date "with or without" claims, does not apply in reissue applications, as 37 CFR 1.173(a)(1) requires the filing of the entire specification, including the claims of the original patent. A preliminary amendment cancelling all original claims without presenting any new claims would be inappropriate under 37 CFR 1.115(b)(1). If an application is filed without claims but otherwise complies with 37 CFR 1.53(b) and the reissue rules, the Office of Patent Application Processing (OPAP) will accord a filing date and send out a notice of missing parts setting a period of time for filing the missing part and for payment of any surcharge required under 37 CFR 1.53(f) and 37 CFR 1.16(f). If the changes to be made to the patent are so extensive that reading and understanding the specification is extremely difficult and error-prone, a clean, typed copy of the specification may be submitted if accompanied by a grantable petition under 37 CFR 1.183 for waiver of 37 CFR 1.125(d) and 37 CFR 1.173(a)(1). Pursuant to 37 CFR 1.173(a)(1), applicant is required to include a copy of any disclaimer (37 CFR 1.321 ), certificate of correction (37 CFR 1.322 –1.324 ), reexamination certificate (37 CFR 1.570 and 1.997 ) or certificate from a trial before the Patent Trial and Appeal Board (PTAB) (37 CFR 42.80 ) issued in the patent for which reissue is requested. If there was a prior change to the patent (made via a certificate, reissue of the patent, disclaimer, etc. ), the first amendment of the subject reissue application must be made relative to the patent as changed by the prior proceeding or other mechanism for changing the patent. It should also be noted that 37 CFR 1.178(b) requires reissue applicants to call to the attention of the Office any prior or concurrent proceedings in which the patent (for which reissue is requested) is or was involved, such as interferences, reissues, reexaminations, or litigation (litigation covers any papers filed in the court or issued by the court, such as, for example, motions, pleadings, and court decisions including court orders) and the results of such proceedings. This duty is a continuing duty, and runs from the time the reissue application is filed until the reissue application is abandoned or issues as a reissue patent. It is no longer required that the reissue applicant physically surrender the original patent, see MPEP § 1416. Where appropriate, the reissue applicant may provide a claim for priority/benefit under 35 U.S.C. 119 or 120, and may also file an Information Disclosure Statement. For any reissue filed on or after September 16, 2012, the priority/benefit information must be in an application data sheet (ADS) under 37 CFR 1.76. An ADS is also required if an application under 35 U.S.C. 111(a) is made by a person other than the inventor. The initial contents of a reissue application are discussed in detail in MPEP § 1410.01 through § 14.8. For expedited processing, new and continuing reissue application filings under 37 CFR 1.53(b) may be addressed to: Mail Stop REISSUE, Commissioner for Patents, P.O. Box 1450, Alexandria, VA 22313-1450. Mail Stop REISSUE should only be used for the initial filing of reissue applications, and should not be used for any subsequently filed correspondence in reissue applications. Reissue applications may be filed through the Office’s web-based electronic filing system (EFS-Web). See MPEP § 502.05. When filing a reissue application electronically, an applicant should choose the "reissue" radio button. Regardless of the manner of filing, all new reissue filings should include a copy of a completed Reissue Patent Application Transmittal Form (PTO/AIA/50) to ensure that the filing of the new application will be recognized as a reissue application. The oath or declaration, any matters ancillary thereto (such as the consent of assignee), and the basic filing fee, search fee, and examination fee may be submitted after the filing date pursuant to 37 CFR 1.53(f). The assignee entity is established by a statement on behalf of all the assignees under 37 CFR 1.172(a) and 37 CFR 3.73. See MPEP § 1410.01. 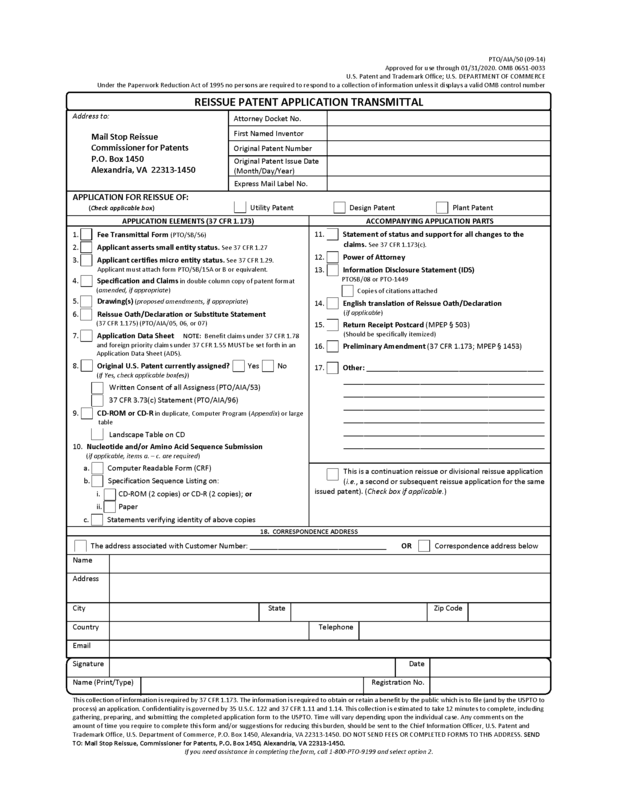 Form PTO/AIA/50, Reissue Patent Application Transmittal, which may be used for filing reissue applications, is reproduced below.